Can anyone provide a photo of a correct speaker installation in an Xk120 FHC? 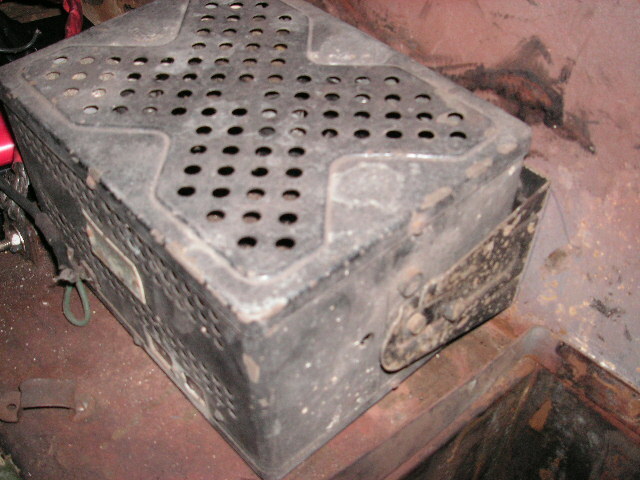 I know the speaker had the grill mesh attached to it, and mounted under the rear shelf which was covered in moquette. But how was the speaker opening in the moquette covered shelf finished off? Did the moquette just wrap around the opening, or was there some sort of metal finishing ring around the hole? And were any screws visible, going through the moquette? A common configuration was to simply drill a batch of ~1/2" holes in the plywood, above the speaker, to allow the sound to exit. 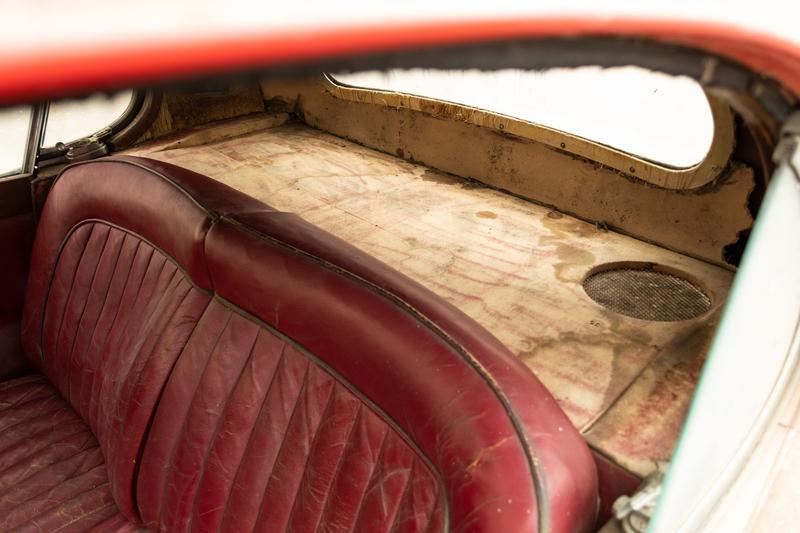 The moquette rested on top of the holes without any fittings or depressions visible. You mean there was not even a circular hole cut into the moquette to show the speaker grill below?? That’s right. There was no circular hole, just a group of small holes, in the plywood, directly over the speaker. My car did not have a grill over the speaker, just the bare speaker cone. Doing it that way keeps the moquette fabric looking smooth/uniform. Mine does not even have the group of small holes in the parcel shelf top. Perhaps we should consider that the practice of putting the speaker anywhere other than inside the radio itself was a new idea at the time. Maybe it was desired to keep it hidden, and the sound quality of AM radio was not greatly diminished by this speaker installation? Here is 679840 from July '52. 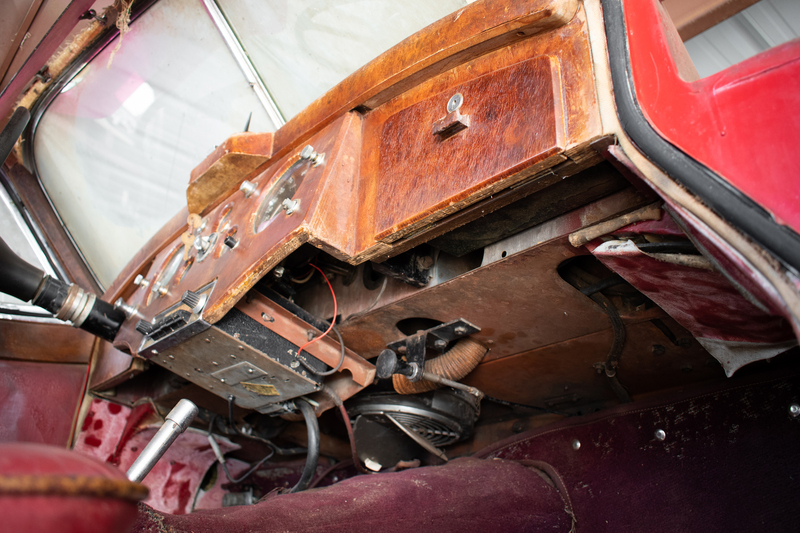 It was incredibly rare for any XK120s delivered to USA to have a factory fitted Radio, thus correct factory installation of all components including the speaker. So I wouldn’t be too quick to make any conclusions about the detail based on cars seen now in USA. 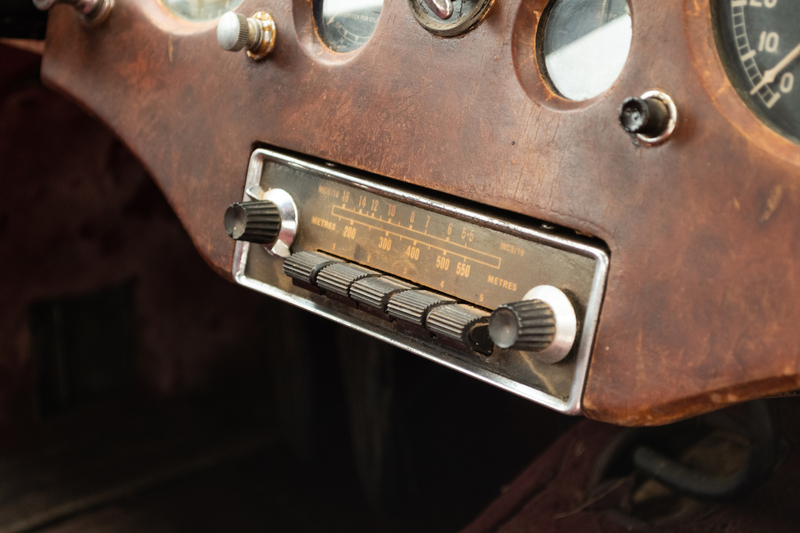 Most USA cars will have dealer fitted radios or some other ‘aftermarket’ non-factory installation, thus detail of installation will vary considerably. I do have several detailed instruction booklets for the installation of RADIOMOBILE Radios (the only Radio ever factory fitted on XK120s), aerial and speaker for different models of Jaguar, including Mark V, Mark VII, XK120 OTS and XK140 OTS, but not XK120 FHC, but these four period booklets will be a fairly accurate guide as to the detail of a factory period XK120 FHC installation. None of these four booklets show a rear parcel-shelf installation for speaker, not that you would expect on the two OTS installations, but both the Mark V and Mark VII installations show the speaker installed offset to passenger side under the instrument panel, or on the footwell vertical kick panel. 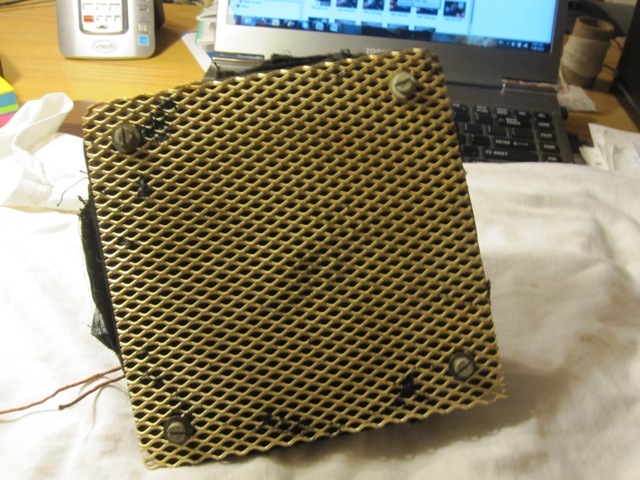 All describe need to expose the speaker grille and not have it covered, and mounting holes are drilled using a template, with secured screw heads exposed. 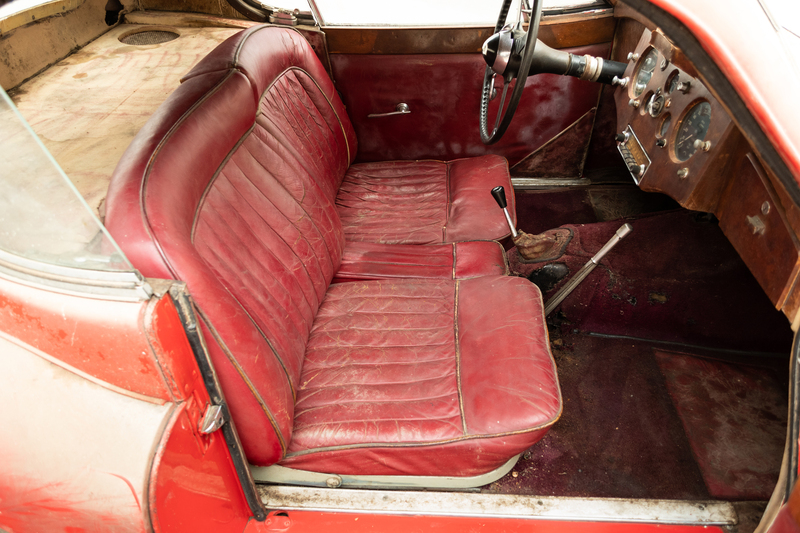 Maybe the factory did do a parcel-shelf mounting on the XK120 FHC, that differed in such detail. Because of the rarity of factory fitted radio/aerial and speakers, most concours guidelines simply require a period correct radio, with all components including aerial and speaker to be neatly and appropriately fitted. Those who want to be more authentic do however seek out a correct Radiomoblie 4200 series model with correct matching Amplifier, a correct Radiomobile aerial properly fitted, and Radiomobile Speaker correctly mounted, or as near as they can. 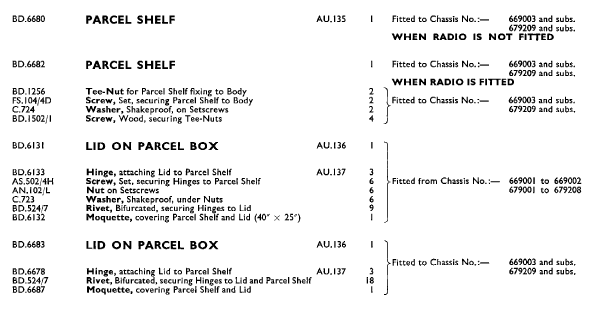 The Radiomobile booklets give part numbers and illustration’s and installation detail of all items, and it is believed to be exactly as the factory installed them if optioned. Dealer and other aftermarket Radiomobile fitted radios in the USA were actually branded EMITRON and not RADIOMOBILE, and indeed were also available rarely with a JAGUAR labelled dial which I cannot explain. It would be great if someone had an XK120 FHC Radiomobile Installation booklet - might clarify a few things. What do you think, Roger? Another dealer installation? My car had an incorrect dealer installed radio with speaker under the dash. HOWEVER the rear parcel shelf had a round cutout for the speaker that was perfectly cut in exactly the same place as Rob’s. I am sure that the cutout was that way from the factory. Rob, what was the build date of your car? I see you have aluminum sill plates. When were those used? Not my car, that is 679840 from Jul '52, currently on bringatrailer in Houston, current bid $24,750. Apparently last registered 1959 in TX, has been repainted and recarpeted so I’m not sure those sill plates are original. I just thought the speaker hole looked a little more professionally done than mine. Mine is 679187 from Nov '51 and no sill plates, but I do have the remains of a Radiomobile radio. 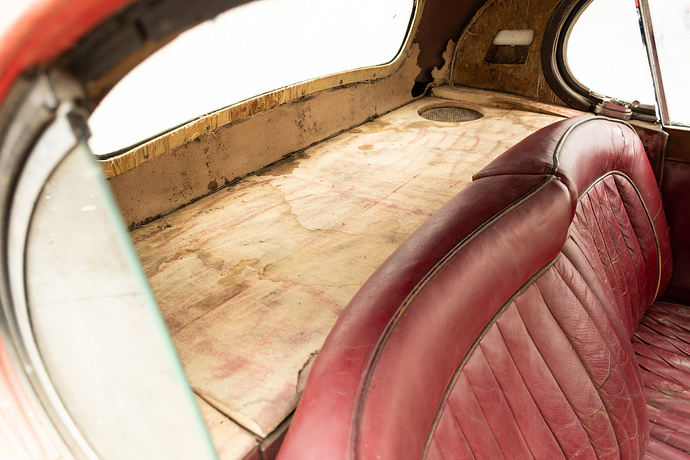 The RADIO unit itself looks to be one of the range of period XK120 factory offerings, and is a RADIOMOBILE unit, and not the North American aftermarket EMITRON branded offering. But I wonder about its poor fit in the timber facia cutout? Maybe just an installation adjustment, but their are signs of an added three-sided perimeter surround once having been there? What branding/markings are on the RADIO Unit? As before, can’t comment about Radio Speaker hole in parcel shelf - I have nothing factory nor Radiomobile definitive for XK120 FHC, but its hard to accept that a factory parcel-shelf installation would not have some solid cover/grille over the top, as if the depressed hole was just covered with unsupported trim, it would be easily damaged/torn. I think I would be looking for cars delivered new to UK, where factory radios were more common, to get a better feel for likely factory fitment of speaker. We also didn’t get many factory fitted radios for new XKs sold to Australia, and off hand I cant think of any possible XK120 Coupes so fitted. Graham Jordan’s FHC was Australian new delivered - any radio Graham? I just noticed in the 120 FHC SPC they changed the parcel shelf and lid, and had different shelves for with or without radio. This was in Nov '51, just a couple of weeks after mine was built.